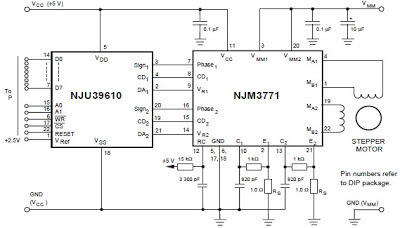 An very simple stepper motor driver circuit can be designed using the NJM3771 stepper motor driver integrated circuit designed by New Japan Radio Co. Ltd. This stepper motor driver electronic project is very simple to design and require few external components . The NJM3771 IC is especially developed for use in microstepping applications in conjunction with the matching dual DAC (Digital-to-Analog Converter) NJU39610. 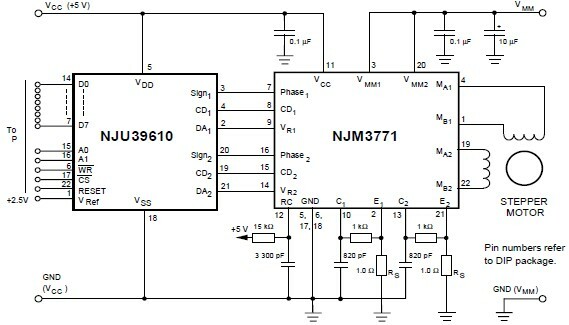 The NJM3771 contains a clock oscillator, which is common for both driver channels; a set of comparators and flip-flops implementing the switching control; and two H-bridges with internal recirculation diodes. Also this stepper motor driver project supports a wide range input voltage : +5 V is required for logic and +10 to +45 V for the motor powering . The maximum output current that is supported by this circuit is around 650 mA per channel. The NJM3771 stepper motor driver has an selectable slow fast current decay for improved high speed Microstepping . The output current to the motor winding is mainly determined by the voltage at the reference input and the value of the sensing resistor, RS. The voltage across the sensing resistor is fed back to the comparator via a low-pass filter section, to prevent erroneous switching due to switching transients ( the recommended filter component values, 1 kohm and 820 pF). This driver IC is designed for bipolar motors, i.e., motors that have only one winding per phase but unipolar motor, having windings with a center tap, can also be used .